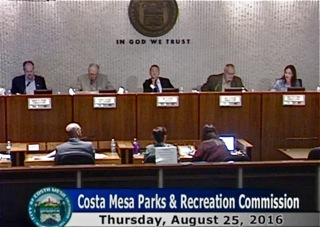 Last Thursday night, September 22, 2016, the Costa Mesa Parks and Recreation Commission met at City Hall before a sparse crowd while many more of us attended the CM4RG Town Hall. 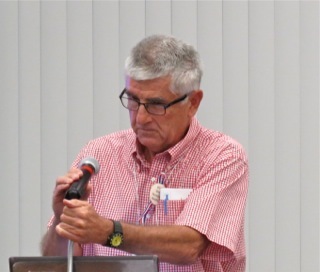 The commission meeting, which I later viewed on my recording of the event, was not remarkable except it marks the first meeting since Maintenance Services Manager Bruce Hartley retired a week ago, and his absence showed. 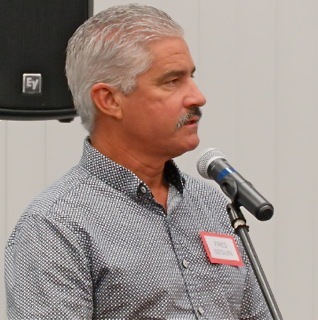 Kevin Stoddardt provided a summary of summer events at several city recreational venues and Yvette Aguilar gave us an overview of other events/programs - Bark Park improvement, Concerts in the Park, Senior Center and Community Gardens. Unfortunately, there was not staff report online to provide a reference tool, so you'll just have to wait for the streaming video to become available if you're interested. During Commissioner Comments Byron de Arakal, Vice Chair Bob Graham and Chairman Brett Eckles paid homage to Hartley, who has provided skill and knowledge to the management of his organization for many years. He CERTAINLY will be missed. It is rumored that he retired to join former Director of Public Services, Ernesto Munoz, in a private sector organization. We wish him well and thank him for his service. There were three tree removal requests on the agenda, each of which were denied. The first, a Brisbane Box, drops a lot of fruit which causes the adjacent property owner some difficulty, but the tree is healthy and the City is managing it and the nearby sidewalk appropriately, so the request was denied. The second was a Canary Island Pine and the applicant failed to show up, so the request was summarily denied. The third was the same species located in a community park near a neighboring home. The applicant said the droppings from the tree - sap, pine cones and leaves - are causing her problems. The staff has recently pruned the tree and, after viewing the photos, it's difficult to see how the problems are actually occurring. The request was denied. 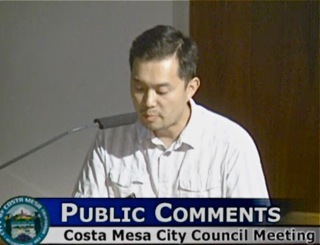 The Parks Manager's Report was presented by Recreation Manager Justin Martin - Bart Mejia was absent. 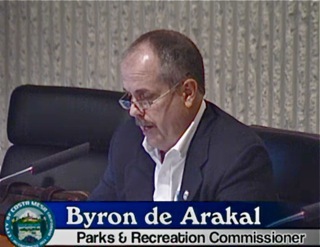 Following the presentation de Arakal asked the status of the proposed fencing of the Fairview Park Vernal Pools and asked that the commission receive a report on the proposed delineation. Oh, yes, Commissioner Julie Mercurio actually did speak at this meeting, so she earned her hundred bucks. Her contribution was negligible, but she was there and spoke. 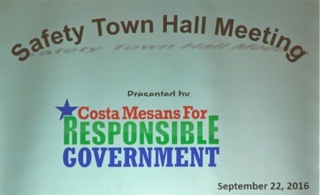 Somewhere around 100 people turned out for the Town Hall sponsored by Costa Mesans For Responsible Government (CM4RG) Thursday evening at the Neighborhood Community Center. 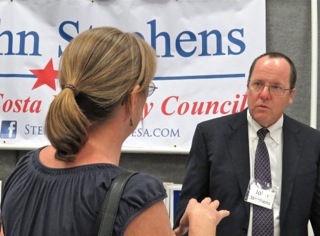 In addition to the presenters of information, city council candidates, representatives of certain initiatives and candidates for the Mesa Water District Board and the Costa Mesa Sanitary District Board were also present to answer questions and hand out literature. Art Perry and Jim Ferryman, running for re-election. 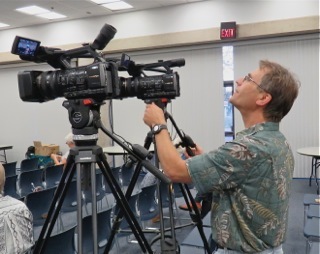 Barry Friedland of Costa Mesa Brief was on hand to record the event, so look for his work product at his YouTube Channel in the next few days. 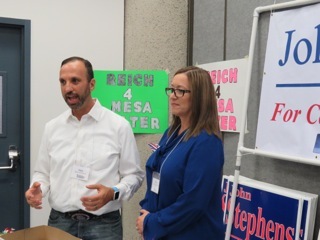 Alex Reich, candidate for the Mesa Water Board, acted as the Master of Ceremonies. 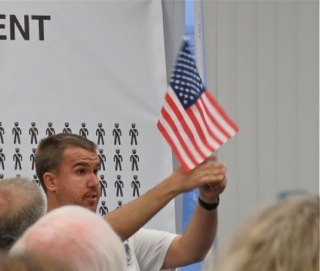 He kicked the meeting off at around 6:45 p.m., then handed it over to CM4RG President Robin Leffler, who led the pledge of alligience and then explained a little bit about the organization. 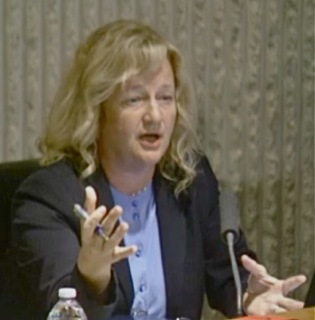 Former councilwoman Wendy Leece then stepped up to provide an update from the Orange County Vector Control Board, of which she was a member during her tour on the City Council. She explained the need for resident diligence due to the growing problems with West Nile Virus and now the Zika Virus. No standing water. Contact Vector Control if you suspect a problem. 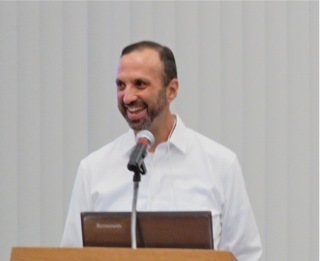 Next up was Ralph Taboada, Chairman of the Bikeway and Walkability Committee and member of the Pension Oversight Committee, to talk about the Costa Mesa Fire Department. 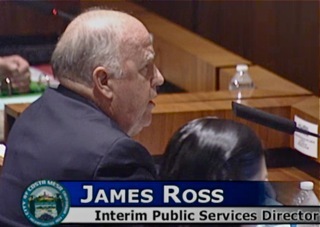 He explained that the department used to be one of the premiere departments in Orange County - a destination department. He explained that the members of the CMFD are active in the community, including teaching CPR and making school presentations. 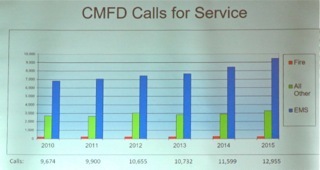 Members of the CMFD are usually pillars of their communities. He explained the history - 5 Chiefs in six years - and used slides to enhance his presentation. These are mostly self-explanatory. 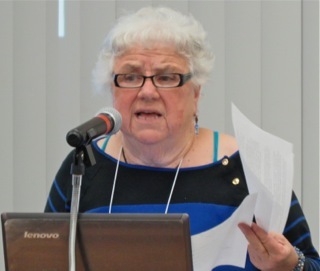 Then came community activist Teresa Drain to speak about Sober Living issues. She told us also on hand for questions was Robert Mann of the Sober Living Network. She gave us some statistics that really made you think. Speaking of heroin specifically, she told us that there have been 1800 deaths due to overdoses in the past five years and the Center for Disease Control estimates 70 lives a lost daily due to addiction. There are 300,000 addicts in Orange County. 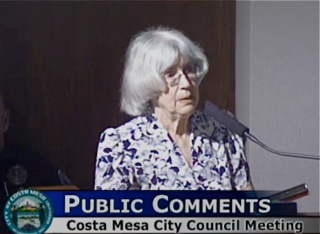 She told us Costa Mesa has 300 licensed liquor dispensaries. She then described Addiction as a disease and Sobriety as addiction in remission. Among the stats she told us was that there is a 86% failure rate with heroin addicts. She spoke about the 12-step programs, first evolving from Alcoholics Anonymous (AA) and now used with Narcanon, too. She spoke of the dual problem of alcohol and drugs and mentioned the Orange County Sober Living Coalition as an organization helping with the problems. She told us that 80% of criminals have drug and or alcohol addiction issues. She told us that 95% of those incarcerated for drug issues return to the drugs once released. She told us that treatment and recovery is the solution, not incarceration, which is why so many petty criminals with drug issues are currently involved in Sober Living Homes. Mary Spadoni, life long law enforcement officer - she was the first woman police officer to work in patrol many moons ago - next spoke about the Costa Mesa Police Department. She spoke about the impact of AB 109 and Prop. 47, and told us to oppose Prop. 57 on the November ballot because it just goes one step further in the wrong direction than Prop. 47. Because of those laws we have many more criminals on our streets. 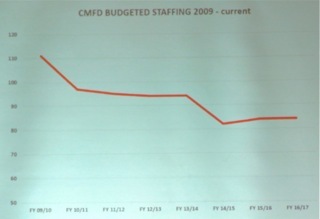 She spoke about the decline in staffing of the CMPD - how the current council majority issued over 200 layoff notices to city employees in 2011, several of whom were civilian employees of the CMPD. 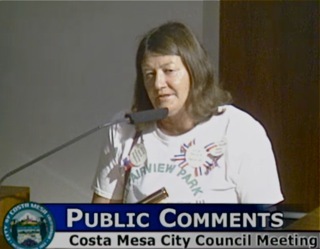 She spoke of how that act caused a lawsuit by the Orange County Employees Association, which represents the employees in question, and how the city lost that lawsuit and cost nearly $400,000 in legal fees. 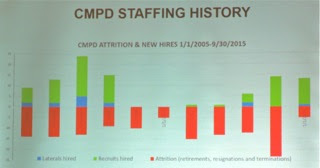 Spadoni told us a little history of the staffing of the department, and mentioned that currently the authorized staffing level of the CMPD is 136, but that we actually have only 113 on the payroll, 10 of which are out on injuries. We have only 52 officers available for patrol duty and many of the speciality assignments to which officers aspire - Gangs, Narcotics, K-9 - are no longer available, which hampers recruiting and retention of officers. 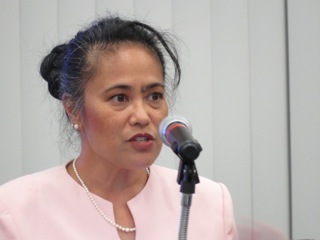 She mentioned the attrition report prepared by former Chief Tom Gazsi more than two years ago which outlined for CEO Tom Hatch the reasons for the departure of so many officers due to retirement and/or moving on to other venues. That report was never acknowledged. Much of that turnover was due to the toxic environment created by the current City Council majority. 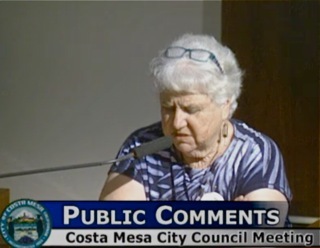 Spadoni told us of a meeting in 2014 of representatives of the County Probation Department and State Parole organization in which Costa Mesa representatives at the meeting were told that parolees like to come to Costa Mesa because we're understaffed in the CMPD, so chances of them being picked up for crimes is small. She described our situation as a perfect storm - fewer cops and greater demand. She said we're "understaffed and overcrimed". She praised Chief Rob Sharpnack for his energy and enthusiasm trying to get the CMPD back on track, but the process is taking a long time - despite what Mayor Mensinger told us earlier this year. 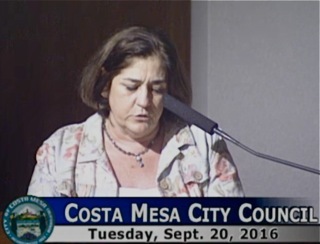 She cited the influx of sober living homes as part of our problem keeping crime down - it's up dramatically. She said we're not "Costa Mayberry" anymore. 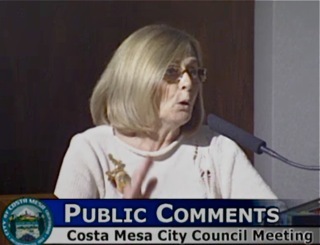 She told us that Costa Mesa has 3% of the county population but 27% of the sober living homes. 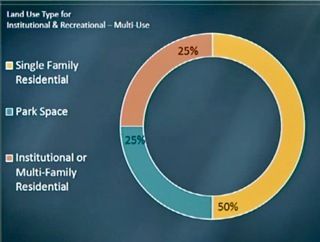 She said 63% of our residences are rentals. She cited the unrealistic positions taken by candidates Mensinger, Mansoor and Ramos on public safety issues. Next came Questions and Answers presented by the audience via note cards. The panel included retired CMPD Lieutenant Clay Epperson - a long-time Costa Mesa resident; Former man-of-many-hats, retired Interim Chief Fred Sequin and Robert Mann of Clear Path Recovery to answer Sober Living Questions. In response to a question about police staffing, Epperson told the audience that we're 5 years behind. That we have a hard time recruiting and retaining officers because of the atmosphere within City Management towards the CMPD. Seguin was asked about work hours. 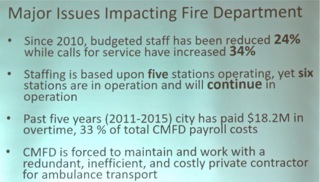 He explained that the CMFD works a 56 hour work week and that it's not at all unusual for firefighters to work hundreds and even thousands of overtime hours because of the depleted staffing. Mann, didn't really answer many of the questions posed to him. Most of the time he waltzed around and did a promotion for his industry and his business specifically. He feigned ignorance of statistics when asked. He was not the only Sober Living operator in the room. He was asked, for example, why there was no mechanism to return failed "clients" to their homes instead of just turning them out onto our streets. He didn't really answer that, except to say his organization sometimes turns those failures over to other organizations. Kind of an incestuous situation. Other questions were asked about rising crime. Epperson told us much was due to drug and alcohol users. Seguin was asked about July 4th fireworks and how it is enforced. He said with current staffing levels it's hard to catch perpetrators in the act. One angry audience member demanded to know how many arrests were made this year - he had no answer. He did say it's hard to catch those shooting off illegal fireworks because they are masked by legal fireworks. He was also asked about the impact of overtime on the firefighters. He responded that it was hard on the firefighters AND on their families due to the unanticipated demands for overtime. He said it's not unusual for a firefighter to work several consecutive shifts without time off. The meeting ended just after 8:30. 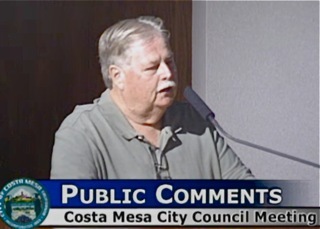 Find the Costa Mesa Brief recording, HERE. It will be worth your time. Thanks to the folks at CM4RG and all the volunteers who put this program together. I think most who attended thought it was time well-spent. Interestingly, despite some grumbling on certain social media sites, I saw no members of the opposition in the audience. That wasn't all bad. 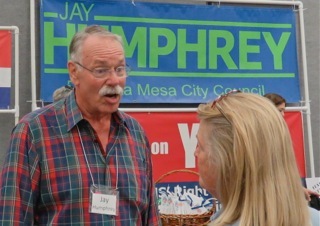 One particularly mouthy candidate for a Sanitary District Board seat kept yapping about attending all week, then did a no-show. No loss. 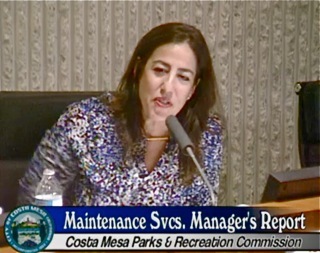 The Costa Mesa Parks and Recreation Commission meets tomorrow evening in City Council Chambers at City Hall beginning at 6:00. You can read the full agenda HERE. As is usually the case, the agenda is thin and I would anticipate this meeting ending before 8:00 p.m. There is an Instructional Class Proposal, HERE, for the commissioners to consider involving using DSLR cameras and two involving Horse Vaulting. Yeah, horse vaulting. 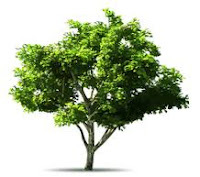 In addition, there are three (3) tree removal requests, HERE, HERE and HERE. 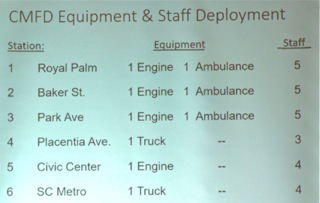 The last two are Canary Island Pines, a species that has been under attack in our city over the past couple years. The staff has recommended denying each of those requests. 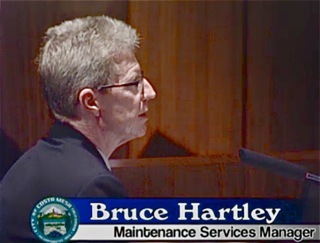 Of special interest to me is that this will be the first meeting without Maintenance Services Manager Bruce Hartley, who retired last Friday after a long career with the City. It's my understanding that he left to join former Public Services Director Ernesto Munoz in a private sector organization. So, we've lost yet another senior manager. I will not be attending this meeting - I'm going to the CM4RG Town Hall at the Neighborhood Community Center at the same time. I will tape the meeting and report on it eventually. 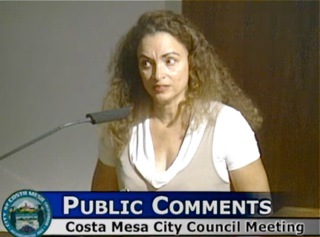 I'll be interested to see if new commissioner Julie Mercurio shows up, and if she does, will she speak? 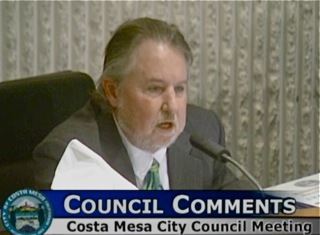 The Costa Mesa City Council meeting Tuesday night was a strange one. First, there were not enough council members present for form a quorum for the Closed Session, so it was abruptly cancelled. A few minutes before that an amended agenda was distributed deleting Public Hearing #2, the appeal of the Planning Commission approval of the Arts and Learning Conservatory on Airway Avenue. One had the opinion - since a crowd had showed up for that item - that this was a hastily-arrived at decision. The item was shoved out to the meeting of November 1, 2016. 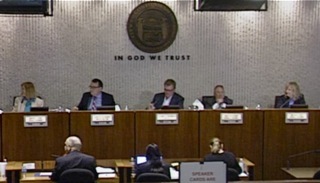 When the meeting finally began only three council members were present. Katrina Foley and Gary Monahan showed up a half-hour late. Perhaps the highlight of the meeting was the presentation of the Mayor's Award to Randy Barth of THINK Together Shalimar Learning Center. Sorry, but I got no images of that presentation. Twenty-two people spoke during Public Comments, many of whom were very concerned about what appears to be a growing problem with coyotes throughout our neighborhoods. Most of those with coyotes on their minds asked for a plan from the City and cited many personal anecdotes regarding contacts with coyotes. One of the main requests was for the City to begin keeping track of coyote reports, even if there's going to be nothing done, so the data can be used to bolster the need for action. Others suggested closer communication with Huntington Beach and Newport Beach, each of which have coyote problems, too. 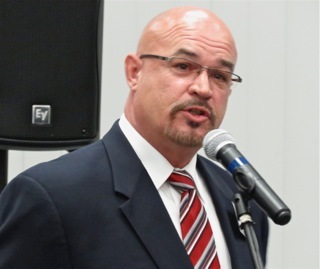 Pastor Mark Linn of the Berean Church, which was a party to the above-mentioned Public Hearing Item #2, spoke with great disappointment because of the shoving out of his issue. He provided a timeline of just how this process has been stalled for several months. 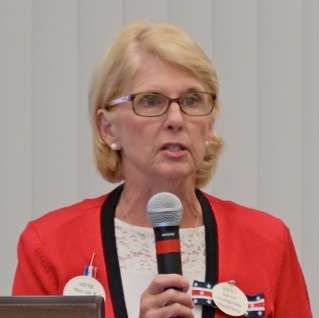 Kim Hendricks shrugged off the coyote issue and spoke about the need to save Fairview Park by voting YES on Measure AA. 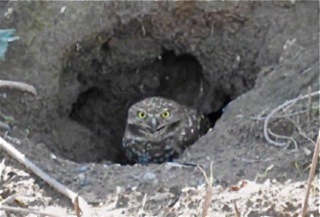 She spoke about the burrowing owl as reason enough to protect that habitat. 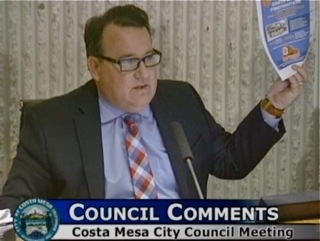 Jay Humphrey spoke of the now-infamous door hanger being circulated by the Mensinger/Mansoor/Ramos campaign team - Team Costa Mesa - which is filled with lies and misrepresentations. 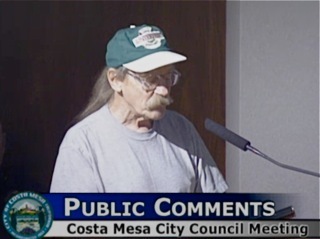 Chuck Perry, one of the signatories of the now-rejected rebuttal argument for Measure Y, the Smart Growth Initiative once again rose to praise the council for their efforts. Poor guy. I suspect he had zero to do with the composition of the rebuttal argument, but he is now painted with the same "liar" brush as the others - including Mayor Pro Tem Jim Righeimer and candidate Lee Ramos. 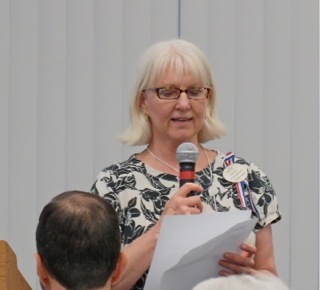 Charlene Ashendorf stepped up to praise the recent film showing at the Senior Center, and praised the Center in more general terms. Beth Refakes told us that the gown drive for the Marine Wives at the 1/5 Marines at Camp Pendleton was a great success. More than 100 dresses were donated. Now comes the candy drive, in which individually-wrapped candies will be collected until October 21st. Tamar Goldmann opened her statement with this phrase, "How low can you go? ", addressing the above-mentioned door hanger. She specifically mentioned the lie about the Smart Growth Initiative being sponsored by developer money. 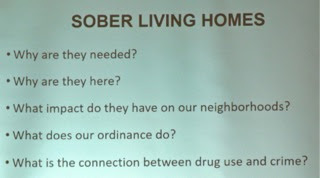 Mary Spadoni told us about the CM4RG Town Hall on Thursday at which Public Safety and Sober Living Homes will be discussed. 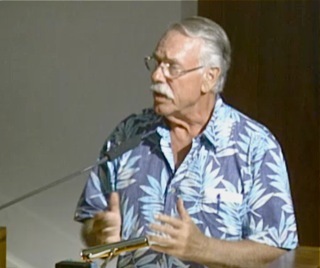 The irrepressible Terry Koken sang a song about Allan Mansoor's previous tenure on the council, including Benito Acosta in the lyrics. It was actually pretty funny. Tea Party Tom Pollitt stepped up and muttered something about unfunded pension liability rising. 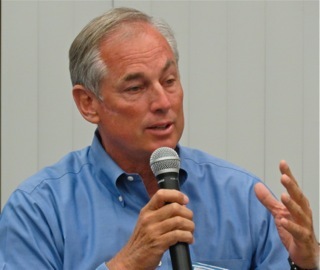 Jim Righeimer broke into the flow of comments to chide one speaker, saying "she does this all the time." 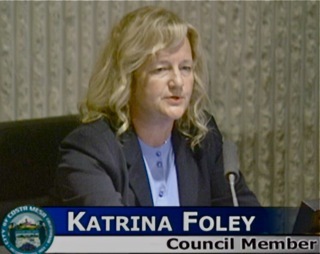 Katrina Foley tossed it right back at him, citing that person's right under the Constitution to say whatever she wanted. She reminded him that he was the only person on the dais to be officially labeled by a judge as a liar. We knew this evening was going to be very special. During Council Member Comments Righeimer led off by asking CEO Tom Hatch to investigate what can be done about the coyote issue, and told us he won't let his daughters walk the dog in his neighborhood. 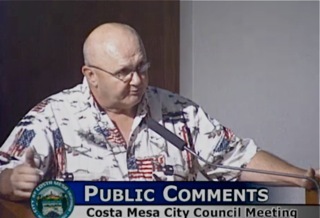 He then launched into a full broadside attack on the Costa Mesa Fire Fighters, waving around a copy of an email flyer announcing an event that group will be hosting at TeWinkle Park on October 1st. He ranted about "overtime" and said he "relished a debate about overtime", implying that the firefighters actually wanted to work hundreds - sometime thousands - of overtime hours because they are greedy. He told us it's all about money - that they don't really care about the residents of the city because none of them live in town. This is a chant that's been developing among the lamebrains at the Costa Mesa Public Square for the past few days. He told us he's not going to let this issue go. His words were, "I'm gonna expose this thing no matter what happens in November." Once again, we have a high-ranking public official threatening an employee group, apparently to intimidate them from supporting certain council candidates. Then Mayor Steve Mensinger took over and asked Hatch to craft a letter to Governor Jerry Brown opposing Proposition 57, the latest iteration of stupidity coming out of Sacramento that is on the ballot in November that will further infest our neighborhoods with early-release criminals. Apparently Mensinger thinks Brown can do something about it - he cannot. This is up to the voters. Nah, that was just another ham-handed political stunt to try to make people think he knows something about law enforcement - he doesn't. He then perpetuated Righeimer's rant about pensions and labor contracts, even though the City is in negotiations with the Firefighters Association. It's all about politics. Next up was Foley and her presentation was worth the price of admission. She immediately launched into a monologue denouncing Righeimer and Mensinger as liars, citing chapter and verse. She rejected Righeimer's claim that the firefighters are "destroying California" by pointing out just how many of them are risking their lives this fire season trying to keep us safe. She was priceless! She also reminded us of the School Board Candidate Forum tonight at the Neighborhood Community Center beginning at 6:30. She also spoke of the Home Tour, and how it will include the Heroes Hall this year. 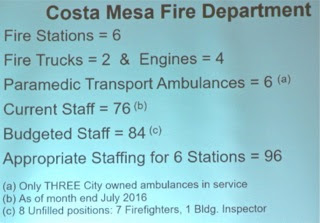 Sandy Genis also spoke of coyotes and at length about the misrepresentation of facts regarding firefighters and staffing. 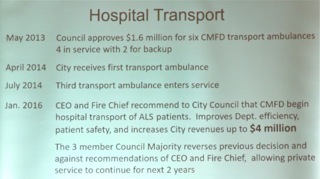 She spoke of CARE Ambulance vs. our transportation of patients which has been forbidden by a Righeimer-led movement on the council. Did we mention there are those who think Righeimer has a familial association with the parent of that company? UH, OH - HE'S SPEAKING! Gary Monahan, usually mute when it comes to comments, decided to speak up this time - a big mistake. He should only speak when he's in full control of his faculties, which he appeared not to be last night. He demanded that Hatch do something about the coyotes. He said, "I'm getting serious on this." Good for him! He mentioned the Police and Fire Department understaffing and also that he's running for a seat on the Costa Mesa Sanitary District Board. 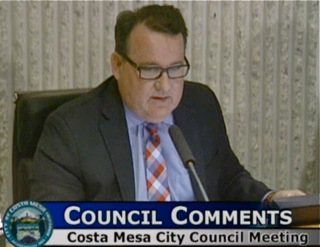 He politicked against Measure Y, citing that the new senior facility near Harbor and Adams - AZULON - could not have been built with Measure Y in effect. Of course, he has NO way to know that. When Mensinger told him not to campaign from the dais he said, "Everybody else is!" 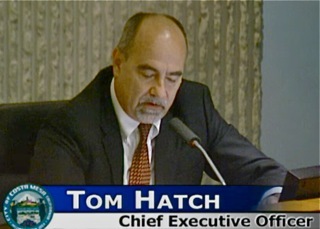 During his time Hatch promised to address the coyote problem, but had nothing specifically to offer at that time. 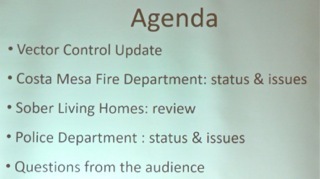 Three items were pulled from the Consent Calendar for discussion at the end of the meeting. The rest passed on a 5-0 vote. 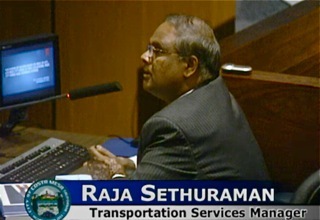 Public Hearing #1, the vacation of right-of-way along 17th Street near Superior Avenue was guided by Transportation Services Manager Raja Sethuraman. The discussion didn't take long and was passed, 5-0. As mentioned above, Public Hearing #2, was continued to November 1st. Public Hearing #3, the rezoning of the Fairview Developmental Center generated some interesting discussion, dominated by Genis and Righeimer, during which some small sections of the language were changed before it passed, 4-1, with Foley voting NO. 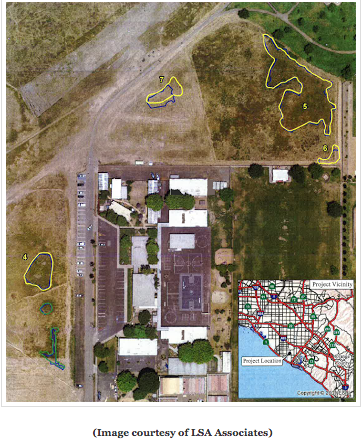 Public Hearing #4, the Mixed Use Overlays along Harbor and Newport Boulevards, was next. This passed, 3-2, with Foley and Genis voting NO. Old Business #1, the 4th amendment to the Segerstrom Home Ranch Development Agreement took only about 2 minutes and passed, 5-0. New Business #2, the selection of a new Senior Commissioner, moved quickly. After the council members drew lots for the order of nomination Foley nominated Charlene Ashendorf - an outstanding choice - and Genis seconded it. When the vote was taken the male majority voted NO. 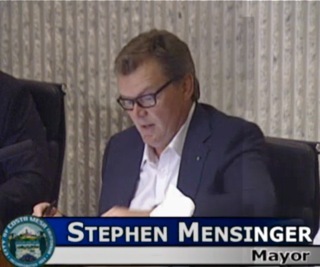 Mensinger, who was second, nominated Gary Parkin and he was selected on a 4-1 vote. Foley voted NO. Mensinger asked about his request to have two more members. Hatch said they would study it... he clearly didn't think it was a good idea. Of course, it's not. 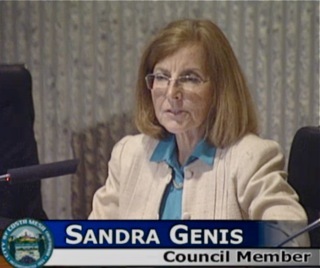 The final item, New Business #2, was the cancellation of the October 18th council meeting so Mensinger could attend an event honoring his former boss and major campaign contributor, George Argyros and his wife Julieanne. 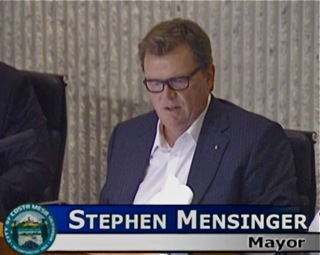 One speaker ripped into Mensinger for this action, indicating that the business of the city should come first. Similar views were expressed by Foley and Genis. In fact, Foley asked Monahan if he was going, because the three of them could run the meeting if Mensinger and Righeimer were going. 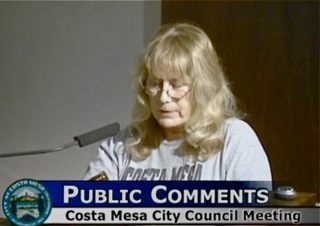 She got no answer, but the council voted, 3-2, to move the meeting ahead to Monday, October 17th. Yet another reason to NOT vote for Mensinger in November. When the trailed Consent Calendar items were heard, the first one was the Warrant. An unidentified person questioned the legal fees, specifically the long list of items under Jones & Mayer. She asked if a line identification could be provided for those individual items and was told they could. This is GREAT news. Now we'll be able to get a clearer view of how they are spending their time - and our money. 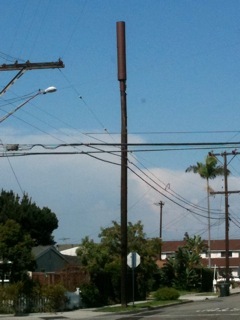 The second one pulled, #4, dealt with a cell tower on a building. Righeimer left the room because the applicant is his customer. 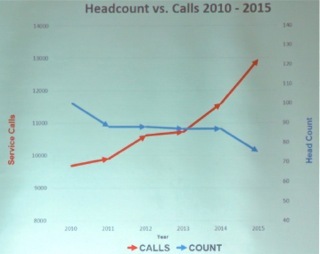 After the same person as above asked about how many cell towers he has around town, and specifically on the old Bethel Towers, the council passed the item, 4-0. The final item was #11. 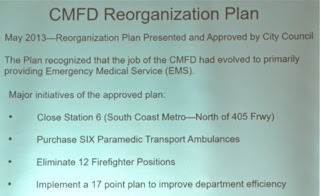 Beth Refakes wanted to be sure that this process - the temporary structures necessary to house firefighters while Fire Station #1 is being re-built - would not delay the construction. Interim Public Services Director Jim Ross assured the council that we had enough engineering strength in-house to manage this project and that it would move forward briskly. The council passed it, 5-0. It was a good thing they did - it took a 4/5 vote to not re-open the issue. Finally, the remaining two Public Comments that had been trailed were presented. 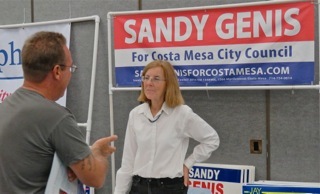 Cindy Black stood behind her sign and chided Mensinger for some of his out-of-town campaign contributors - Howard Ahmanson and George Argyros. She also spoke of the aforementioned mailer, full of lies, and speculated that it was a work product of Dave Ellis, notorious campaign consultant. She left them with a new mantra to use - "3 to 2, Screw You", citing that this has been the way they operate. WHERE'S THOSE DEVELOPER BUCKS, STEVE? 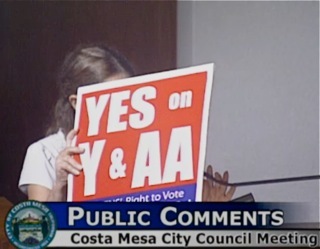 Cynthia McDonald addressed the infamous door hanger and specifically as it misrepresented Measure Y. On that section it says it was secretly funded by developers. McDonald said that she guessed Mensinger's developer-friends hadn't gotten the word because none of their checks had arrived. 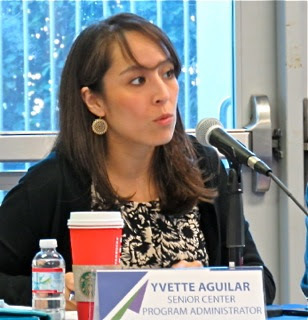 She gave an address to which they could be mailed - tongue-in-cheek - and reminded everyone that Measure Y was created by the people, for the people and was funded by scraping up scraps from people. 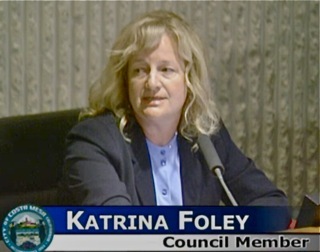 At the very end of the meeting Foley again demanded that she get an accounting of the costs being charged to the City by Rutan and Tucker for their part in the creation of the Measure Z, the competing issue to Measure Y, and for the defense of Righeimer, etal in the bogus rebuttal argument. 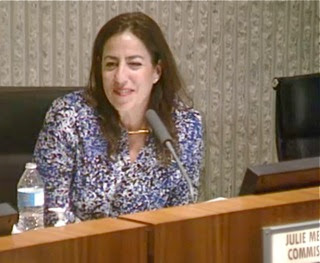 City Attorney Tom Duarte assured her she would get it soon. Uh, huh... I'm thinking Foley will not be holding her breath. The meeting ended a little after 9:00 p.m - plenty of time for Righeimer to go home and walk his dog, since his girls couldn't do it because of the coyote scare. Yes, he said that earlier.